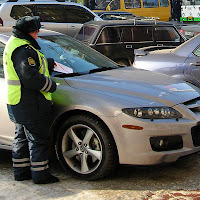 Some months ago Moscow internet-magazine “The Village” created a mobile application to struggle with wrong and illegal parking. In last Cannes Lions International Advertising Festival this project got the Lion and now I want to tell you about it. In general, the Lion award is like advertising Oscar. Last year Russian advertising agencies became to receive prizes of this Festival and thanks to that reputation of Russian advertising industry became to grow up at the international scene. The application “The Village: Parking” is very easy to use. If you see a car parking incorrectly you make a photo of it, chose its colour and a body type, and publish. All this is done in only one screen. It’s handy and understandable. But the main idea is not to gather information about breaches; the most important is to spread this information. For example, a man is reading Internet article, and suddenly the 3D picture of car is appearing. He points a cursor to the image and the banner darts out. This banner says that it disturbs you such way as this car in certain street. The banner shows cars-troublemakers which was photographed not far away, for example, near offices or in a court. Then people spread these photos in social networks. Web-sites taking part in this project are The Village, Look At Me, FurFur. It’s about 2.5 million people every months and also the social networks. The Village creative director Ekaterina Bazilevskaya says that company wants to create an international platform, to unite all media not indifferent in this problem. The application is translated into some languages. People from Germany, USA and other countries asked The Village to develop its project abroad. Ekaterina is sure that shame in this situation is the most powerful method to break drivers of bad habit to leave their cars at not appointment places. Through some months it will be possible to know how many people changed their behavior. The Village follows recurrences of every car’s breaches. Some project’s friends say that they became more conscientious. Moscow has a lot of tools to overcome illegal parking. Young activists stick labels to cars “I’m parking like moron”. There are too high fines for incorrect parking. But sometimes nominally legal parking is not polite, for example, when one car takes places of three ones. And you should remember it. WOW! This is really great. I should support this one.